Turquoise and Freshwater Pearl necklace. 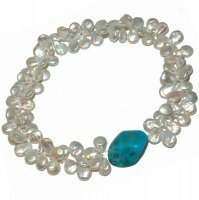 A Freshwater Pearl and Turquoise necklace. A layered row of 80 White Freshwater Pearl drops (15mm) with a central large Turquoise nugget(35mm) to a silver ring and bar clasp. Length 17 inches (43cms).